On her way to the Olympiad, IM Irina Krush stopped in Moscow for the World Women's Blitz Championship (September 15-18). 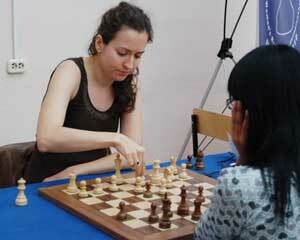 Irina qualified for the 16-player finals with a fantastic 19/26 score in the semi finals. Check out one of her wins over former Women's World Champion Zhu Chen and view and download complete games on the site. Irina will join five other semifinal qualifiers, reigning Women's World Champion Alexandra Kosteniuk, six players by rating and various other wildcards and qualifiers in the 16-player final. See complete tournament regulations on the official site. Also see a full gallery of photos.